Copper is rapidly disappearing in telecommunications networks. It’s replacement, fiber optic cabling, may be run through the same conduits when copper bundles are removed, or it may be trenched nearby. The old copper lines are then left to slowly return to nature, much like obsolete two lane highway superseded by newer interstate construction. But, you say, I still have copper connections. The RJ45 cable to my computer is clearly twisted pair copper wiring. So is the coaxial cable that provides broadband to the office. Just where is all that fiber you are talking about? The quiet revolution in fiber optic transmission is occurring just out of sight. The reason is simple. Standard Ethernet cabling works great in the home or office. You can easily get 1 Gbps and perhaps even 10 Gbps performance… as long as you keep the cables short. That’s 100 meters or 328 feet for CAT5e or CAT6 at 1 Gbps and CAT6A at 10 Gbps. CAT 6 can also do 10 Gbps at 180 feet or less. In most smaller offices you never need longer runs to get to the nearest switch or router. Since most network equipment you use every day has a RJ45 10/100/1000 Mbps interface, you’ll probably never have to deal with a fiber optic connection. That is, unless you work in the IT department in a company large enough to have one, or work for one of the telecom carriers. Just beyond your view, the interface changes from copper to fiber optic wiring. Why? Speed and distance. If you want 100 Mbps Fast Ethernet or 1,000 Mbps Gigabit Ethernet, you need fiber to carry those high speed packets across campus and beyond. You may have copper patch cables at each end, but in-between it’s all fiber. If you don't look inside the beast, you can pretend that the Internet is millions of miles of shiny copper wire in a web that covers the Earth. Actually, that’s how it started out. Today that notion is as dated as those obnoxious dial-up tones. The world’s long distance networks have long since been converted to fiber. Fiber is also rapidly replacing the local telco physical plant. When hurricanes and other disasters strike, the phone companies jump to install new fiber to replace plastic coated and even paper coated multi-pair bundles that might be many decades old. Both capacity and reliability are improved and higher speed services are possible. Why, then, do telephone and broadband connections look the same as they always have? Someday they’ll be changed out, too, but right now it makes more sense to avoid the high cost of running new lines in from the street or rewiring old buildings. The trick to keeping the old twisted pair and coaxial cable able to meet today’s needs is to run the fiber to the junction box at the curb and connect to the existing copper. As you might guess, this is called Fiber To The Curb or FTTC. It’s a stop-gap measure that works well… for now. The next logical step is for the service providers to just run the fiber right to your building and give you a fiber or copper connection at the demarcation point. For business bandwidth services, this is becoming the norm. Tens of thousands of cell towers are also being newly served by fiber optic lines. These replace the trusty T1 lines that work great up through 3G, but aren’t up to 4G speeds and certainly not 5G wireless. This service is logically called Fiber To The Premises or FTTP. For residential service it is often referred to as FTTH or Fiber To The Home. There are two main flavors being deployed. One is active fiber that has all the electronics end to end. The other is a less expensive approach called passive fiber that uses passive optical splitters to connect multiple locations to one shared active fiber strand. You can pretty much bet that whatever provider you use is running their core network on high speed fiber, probably at 40 Gbps or 100 Gbps. The question is whether they are connecting to you via legacy copper twisted pair leased from the telephone company or bringing fiber right to the premises. Cable companies use HFC or Hybrid Fiber Coax systems, so the less expensive coax broadband service joins their fiber plant nearby on a pole or curb termination box. Cable companies can also connect you directly to their fiber network for higher performance services. The beauty of bringing fiber to your premises is that it helps future-proof your service. If you install, say, a Gigabit Ethernet port, you can subscribe to any line speed up to 1 Gbps. If you only need 100 Mbps or even 10 Mbps right now, you’ll have the option to turn up the speed quickly with only a phone call. Some providers are now letting their customers log into the system and upgrade their service themselves. Billing accounts for upgrades and downgrades automatically. Not sure what service makes the most sense for your business? Discuss your needs with one of our expert consultants and see the range of bandwidth options available for your location. 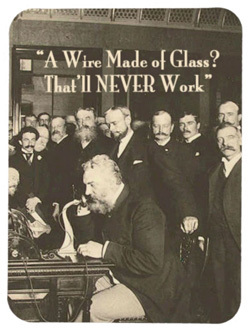 Note: A humorous collection of tech giffts with the theme, "A Wire Made of Glass" are available through Zazzle. Telexplainer is a telecom and network focused business to business service intended for commercial enterprises ranging from independent professionals to small retail and on up to major corporations. Copyright 2004 - 2019 by John E. Shepler, all rights reserved. Picture Window theme. Powered by Blogger.